A lot of parents still ignore signs warning about the dangers of using strollers on escalators. Simply take the extra time to use the elevator with your stroller as opposed to the escalator. The reports of serious head injuries prompted the CPSC to announce a nationwide warning to consumers that have these — not to put these on elevated surfaces and be aware that children can climb out of them or they can tip over in these chairs. One of the more serious incidents involving a Bumbo seat was baby Dylan Lamm. 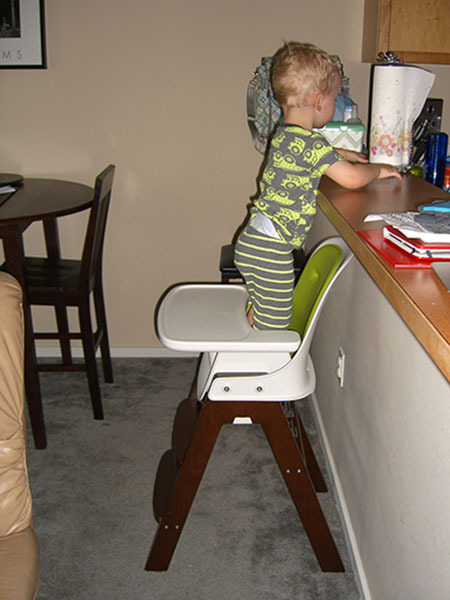 Dylan had arched his back and tilted the Bumbo Seat, causing him to fall backwards and onto the kitchen floor. His skull cracked in two places. An emergency surgery saved Dylan’s life, leaving a long scar on his head. Buckling up a child in a car is important. Unfortunately some parents do not strictly adhere to such practice at home. A study found that about 24 children a day are treated in U.S. emergency rooms for high chair-related injuries. You will be surprised that some parents remain complacent or naive about their homes when it comes to safety. It is really important that you baby proof your home to keep your child safe as unintentional injury is one of the top killers of children in the U.S. Believe it or not, your home can be one of the biggest threats to your child’s safety. Child safety experts agree that baby proofing your home gives your baby a safe environment to play and explore while preventing potential serious injuries. Just don’t take baby proofing for granted. It should only take you several hours in total. By doing so, you’ll have peace of mind and a home that is safe for your baby. To learn more details about this great list of safety reminders that Lacy Stroessner of mom.me put together, you can read the full article here. Please share this article with family and friends to keep your precious babies and toddlers safe from harm. So which of these things are you guilty of doing? Put the baby inside the cart in carrier. That’s what I do I just don’t get a lot of stuff if he’s with me. I have only done one of thes ed things on the list. That being the car seat on top of the shopping cart. My car seat however fits perfectly and latches onto the metal of the shopping cart like it does to the base that it is designed to go in, in the car. I can pull on it and it won’t go anywhere. I have have never had any problems/accidents doing this. I would agree that it can be dangerous if your car seat does not fit securely. Your seat is NOT designed to go on top of the cart. Even though it latches it can still ruin your latches and stretch them out and cause problems with them latching onto the base. My carrier carseat in the back clicks on to the cart a the grocery store, so it won’t go anywhere. Imagine if someone crashed into your cart and your child fell. You’d feel pretty stupid,, your stupid for doing it in the first place. Super dangerous. Shopping carts are not meant for car seats. Carry your kids or invest in a stroller. Where do u put ur groceries if ur pushing a stroller? How do u carry an infant and push a basket if they can’t sit in the basket on their own yet??? So confused!! You must not have kids. I can carry a kid in my arms and push a cart easily OR carry your kid in something that straps him or her to you. Then you have 2 hands to push the cart. Or plan ahead and have someone else watch your child if you truly can’t function (safely) at the store with a child. I have had two kids in one cart my oldest on top n my youngest in her carrier in the bottom. I pulled another cart behind me for groceries. You can baby wear and push a cart. I’m glad I came across your article. Now that I’m aware, I certainly would not be doing some of these and risking my child’s life. Thank you. This article if filled with gadgets westerners have made to protect their babies only to realize they don’t. I wonder if the writers have ever been to a third world country and seen how babies are raised. Accidents happen and a child will never be protected from all harm. Just use common sense but I feel that most Americans are lacking this. Why is there nothing about bedsharing on here? Bed sharing is safe if you follow the guidelines. However, they should mention the guidelines in the article. First and foremost being never sleep with a child on a couch or recliner!